Curry is such a great weeknight quick fix dinner. It’s a vibrant, one-pot dish, doesn’t take too long, packs a ton of flavor, and does well when loaded with all kinds of local, seasonal veggies. Zuzana and today we have for you a new recipe and a GIVEAWAY! So let’s get right to it. 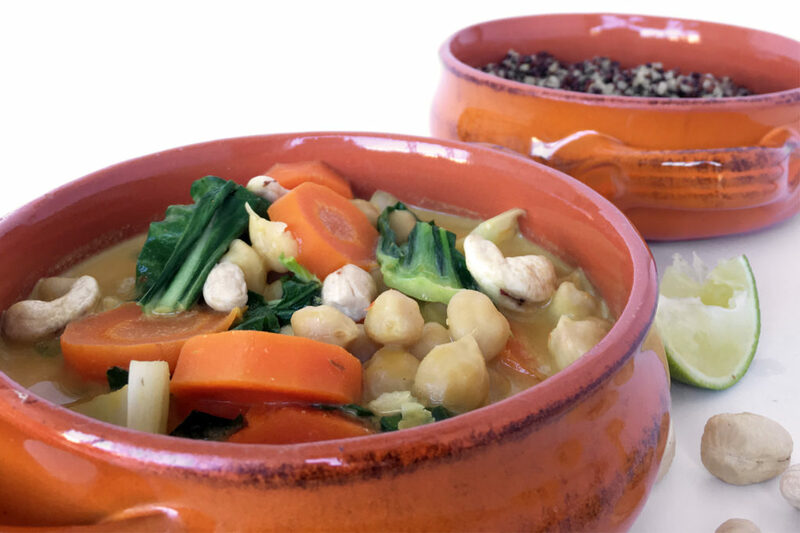 This curry creation is an adaptation from a new vegan cookbook we have recently received called The Vegan 8. 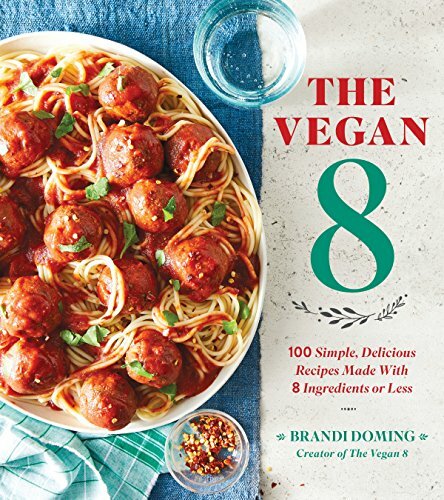 As the name suggests all of the recipes in The Vegan 8 book are vegan and made using 8 ingredients or less, not counting salt, pepper or water. They are also allergy-friendly and nearly all are gluten-free, but more importantly, they are delicious, unique yet somehow familiar, considerate of time, and made with accessible ingredients. The book is for absolutely everyone, whether vegan, vegetarian, omnivore, health-conscious or not, it will get you excited to cook. This all-inclusiveness and approachability are so hard to achieve with a plant-based cookbook, but Brandi Doming of The Vegan 8 managed to do it! We adapted the original Easy One-Pan Red Curry with Spinach and Carrots a bit by swapping the spinach for equally awesome and highly nutritious bok choy. If you have never cooked with bok choy before, we suggest that you give it a try. Thanks to its subtle sweetness and crunchy bite, bok choy is highly versatile (perfect for this flavourful curry recipe) plus it is packed with phytonutrients that help nourish and detoxify the body. 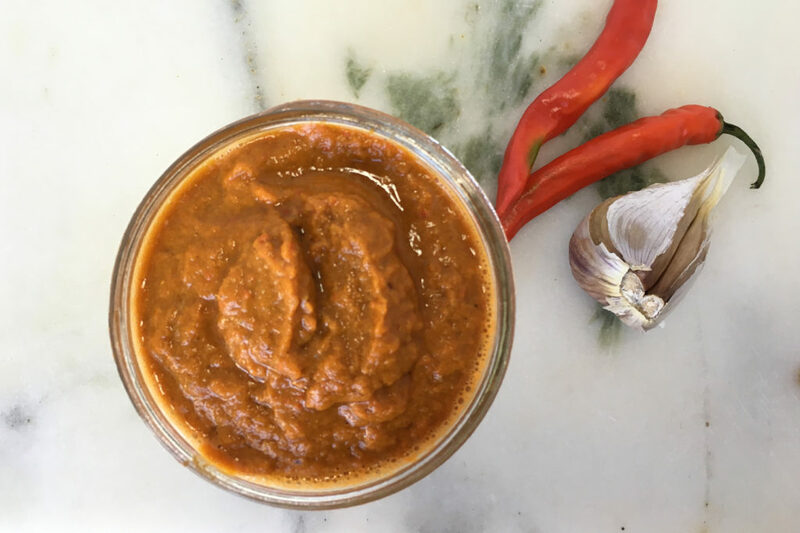 We also decided to make a homemade red curry paste, however, if you are short on time you can find a decent one in the store or online. Just make sure to read the ingredient list and watch for any added sugars and ingredients you cannot pronounce 😉 You can, of course, experiment by adding all kinds of vegetables here, depending on what’s in season/what you have on hand. Hope you’ll give this one a try! We are giving away one copy of The Vegan 8 cookbook. To enter, leave a comment here telling us about your go-to recipe for this transitional time of year and a working email until Friday, October 19th, 2018. Giveaway is for U.S. and Canada only. comfort in a bowl, and the one-pan method makes it simple. This dish comes together quickly, so be sure to have all of your ingredients prepped and ready to go before you start. You can serve this over quinoa or rice. The cashews add a lovely crunch to this dish, but you can omit them to make it nut free. heat and cashews for a satisfying crunch, if desired. 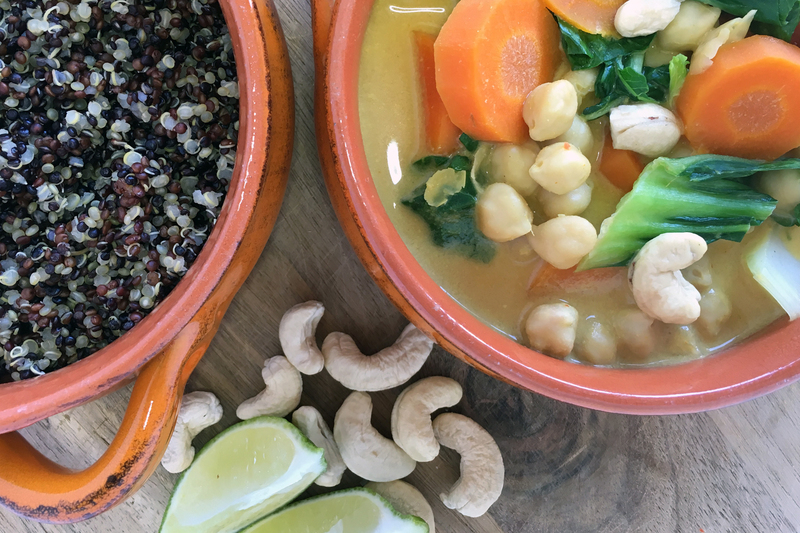 For more curry dishes, be sure to check out our Quick + Easy Veggie Curry, Vegan Thai Curry In a Hurry, Tempeh Curry With Sweet Potatoes & Asparagus,Lemongrass Infused Butternut Squash Soup and Thai Curry Sweet Potato Soup ! If you try this curry, let us know! Leave a comment, Pin for later, and don’t forget to tag a photo #avrecipes on Instagram. We would love to see your creations. Eat a fresh organic plant-based whole food diet to lose weight, heal diseases and feel alive. A clean diet based on fruits, vegetables, sprouts, nuts and seeds is the best for us humans and the world at large. Share this message with the people in your life. My go-to recipe this time of year would definitely have to be Zucchini Chedda Soup from the book Becoming Vegetarian by Vesanto Melina and Brenda Davis. The cashew cheese sauce makes this soup irresistible! Such a great, guilt-free comfort food during the colder months! Mmmmm, cashew cheese sauce in a soup sounds delishious! Shawarma with chickpeas and sweet potato! Laura, thank you for your comment and guess what? You are the winner of our random draw. CONGRATS! Please message us with your best adress so we can send you a copy of the Vegan 8 book. Taco salad is easy and works for me anytime of the year. I really like soups with the last of the summer and beginning of fall veggies. Thanks for the comment Corrine and big YES to soups 😉 You can pack so many vegetables into one great meal! Who won the giveaway? Thanks!